Today we are reviewing the BOB Revolution SE Duallie Stroller in detail. In this article, I will be covering the features it has, along with some pros and cons of this popular stroller. The BOB Revolution SE Duallie Stroller weighs 34 pounds and has a swivel front wheel system that allows for superior maneuverability. It locks forward for increased stability when the terrain gets bumpy, and has an easy, two step folding lightweight frame for when you want to take it along in your truck or backseat of your vehicle. This stroller has an state of the art, adjustable suspension system which provides an exceptionally smooth ride for your most precious cargo. An accessory adaptor allows for the quick and easy attachment of the BOB Infant Car Seat Adapter or a snack tray for eating on the go. The adjustable reclining seat is great for seating comfortably. The five-point padded harness keeps your child comfortably secure. The wheels of the BOB Revolution SE Duallie Stroller are made of high impact polymer. On the stroller, the rear wheels are a bit bigger at 16 inches in diameter, as opposed to the front wheel which is 12.5 inches in diameter. The front wheel can be set or fixed. Also, the tires are able to handle any type of terrain. These wheels are also removable, so that they can be easily stored in your vehicle. This is a big plus because you never know when you need to fit your BOB Revolution SE Duallie Stroller into a small space. Your stroller might fit perfectly fine in the back of your truck bed or trunk. But, this could change if you are tagging along as a passenger in a friend's smaller vehicle and have less space. The set up of the Bob Revolution SE Duallie Stoller is that the seats are side by side. Most, but not all, double strollers are set up this way. Both seats recline individually which is perfect for when you have 1 child who may be sleeping and another one wanting to sit up and enjoy the ride. This is a big advantage when you have 1 infant and 1 toddler. You can have the infant tilted back, while the toddler can sit up at a better angle for seeing around. Both seats tilt back to 68 degrees. To recline the seat you just need to pull up on the straps that are located on the back of each seat. You may need to use both hands to do this. This stroller is made of water resistant material that is also easy to clean with water and soap. Anyone with small children knows that being able to easily clean up spills is a positive feature. The seats have ultra-padding made from thermo molded materials, which, is a great feature for those cooler weather outings. This material is strong enough and tested to accommodate up to 50 pounds for each passenger. It is recommended for babies starting at 8 weeks of age. BOB stroller seats accommodate an infant car seat for the tiniest of passengers. Once your child can sit up and has proper neck control, you can use the seat without the car seat adapter. For brakes, the BOB Revolution SE Duallie Stroller has a parking brake but not a hand-operated brake system. The parking brake is a safety feature for when you stop and want to keep your passengers on board. Once the brake is set, the stroller is immobile until you release the brake. Unfortunately, this stroller does not have a handheld braking system. In my experience, I believe a hand brake is also essential for walking down steep city streets or trails. The faster you plan on going, the more important a wrist strap will be. Luckily, the Bob Revolution SE Duallie does have wrist straps. This safety feature is extra insurance for your family. Should you trip or fall, your passengers won't go traveling without you into an intersection or down a mountain trail, because they'll be attached via wrist straps. It's ideal that each seat has it's own adjustable canopy. You can set them independently, which is really nice for the individual taste of your children, and if one is more sensitive to the sun or just wants some shade. If one of your children falls asleep you can also adjust the canopy for shade. The canopies are nice and large so they offer great protection from both the sun or rain. I like the peek a boo windows on top. That way you can keep an eye on both of your children without having to stop. One benefit of this stroller is that is has a lot of storage. Holy moly, the baskets under the stroller are so big! This is great for shopping or storing towels and toys for a day at the beach. It's convenient that the storage baskets are accessible from all sides. There are also two mesh pockets inside each seat for storing more items. I like the back of the seat storage, because i hav always liked to put my keys and cell phone in my stroller. These pockets are an easy access point for taking a photo quickly if the wildlife or something cool passes in front of you. The BOB Revolution SE Duallie Stroller is backed by a 5-year warranty on the frame, and a limited 1-year warranty on small parts and fabric. From the research I conducted, the majority of people that have this stroller and reviewed it, love it for walking. They also like the storage capacity, the sturdy feel, and smooth ride. I didn't find many avid runners who used it though. This may be due to the lack of handbrake. Many parents love their BOB because it is so durable and can hold a lot of weight. One mom had 4 children in her stroller on an outing to the zoo. Four children on board is not recommended of course, but she said it worked great. This stroller would be an excellent people who like to walk or jog slowly, but not running due to the lack of hand brakes. 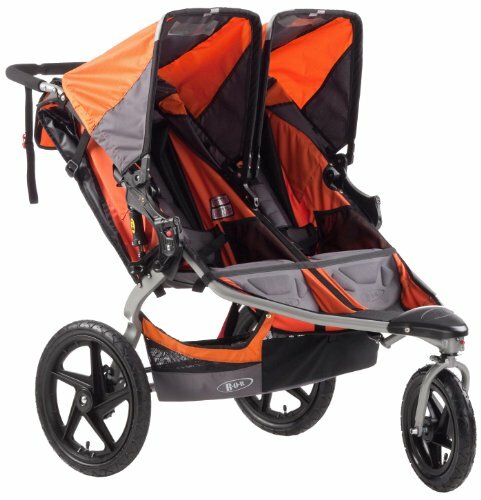 ​Overall though, if you want a high quality durable stroller for walking or jogging slowly almost anywhere, I'd recommend this stroller. The storage capacity is great and so is the comfort features for your kids. The thermal seats and large canopies will insure that your travelers stay comfy. To check out our full review on the top ten double strollers of 2018, click here.